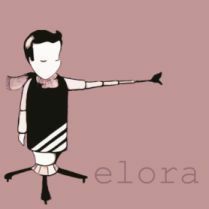 On these songs Elora is: Jason Scott- Guitar and vocals, Jarred DeArmas- Guitar, bass, and vocals, Jordan Calhoun- Bass, Guitar and Andrew Bennett-Drums.All songs written and produced by Elora. Guest vocals on 'Kicking Screaming' by Andrew Mrvous. This 7 song ...expand text.